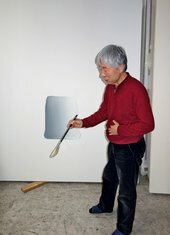 Lee Ufan (Korean: 이우환, Hanja: 李禹煥, Korean pronunciation: [iːuhwan] born 1936 in Haman County, in South Kyongsang province in Korea) is a Korean minimalist painter and sculptor artist and academic, honored by the government of Japan for having "contributed to the development of contemporary art in Japan." The art of this artist, who has long been based in Japan, is rooted in an Eastern appreciation of the nature of materials and also in modern European phenomenology. The origin of Mono-ha may be found in Lee‘s article "Sonzai to mu wo koete Sekine Nobuo ron (Beyond Being and Nothingness – A Thesis on Sekine Nobuo." Once this initial impetus given, Mono-ha congealed with the participation of the students of the sculptor Saito Yoshishige, who was teaching at Tama University of Art at the time. 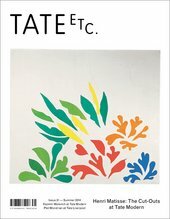 One evidence may be found in the book [ba, so, toki] (場 相 時, place phase time) (Spring, 1970). Lee, the main theorist of the Mono-ha (“School of Things”) tendency in Japan in the late 1960s and early 1970s, was trained as a philosopher. As a painter, Lee contributed to 'Korean Monotone Art' (Dansaekjo Yesul, 單色調 藝術), the first artistic movement in 20th century Korea to be promoted in Japan. He advocates a methodology of de-westernization and demodernization in both theory and practice as an antidote to the Eurocentric thought of 1960s postwar Japanese society. Lee divides his time between Kamakura, Japan and Paris, France.